Pricy cold brews that would excite any hipster, ready-to-serve milky, coffee-colored syrups sold in paper cartons, tepid at-home versions poured straight from a pot and subdued with massive amounts of ice - the hallowed iced coffee certainly gets its fair share of variety. For about six months out of the year the thought of coffee brings little temptation, but come April, my palate transforms into that of a coffee addict and I am rarely seen without a glass in hand between the hours of 7-10am. Perhaps more than any other, this simple drink is surrounded by varying opinions of how to achieve the "perfect" cup of summer joy. I have tried a great many of them, but roughly a year ago, I honed in upon the one method that I really believe to be the best. 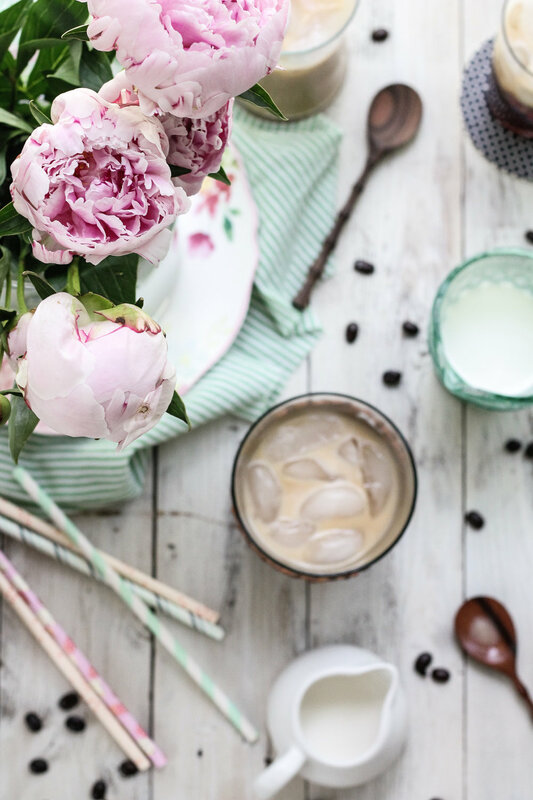 Many friends, baristas included, have asked how I make my favorite iced brew, so I figured it was high time that I share these simple tips that I have come to consider absolutely essential. Sure, it is just coffee, but it is so often our first sip of the day, and I think that entitles it to some extra care. First, we buy the beans. This is my favorite roast of all time. Yes, it is pre-ground. No, it's not $50 a pound. But it is my very favorite coffee and believe me, I have tried A LOT. A french press is my go-to brewing apparatus. This is the model I own, but any press will do! One-third cup of coffee grounds brewed with 3 1/2 cups of boiling water produces the most perfect cup. It is a little on the strong side, but that is just what we want for iced coffee. Now, please do not cheat. I know you want your coffee, and I know that planning in advance can be a struggle, but I am begging you resist the urge to add ice to coffee that is anything but cold. I like to brew a pot before I go to bed and tuck it in the fridge for the following morning. Your future self will send you all the love and good vibes. And, as a bonus, you will feel like an adult who really has her life together when you find a pitcher of coffee ready and waiting for you at 6am. It's the little things. This is the only factor in my "perfect cup" equation that I change up now and then. If I am going to be the only one drinking this coffee, I like to stir in the sugar while the coffee is still hot, so that I need only add the cream before dashing out the door. 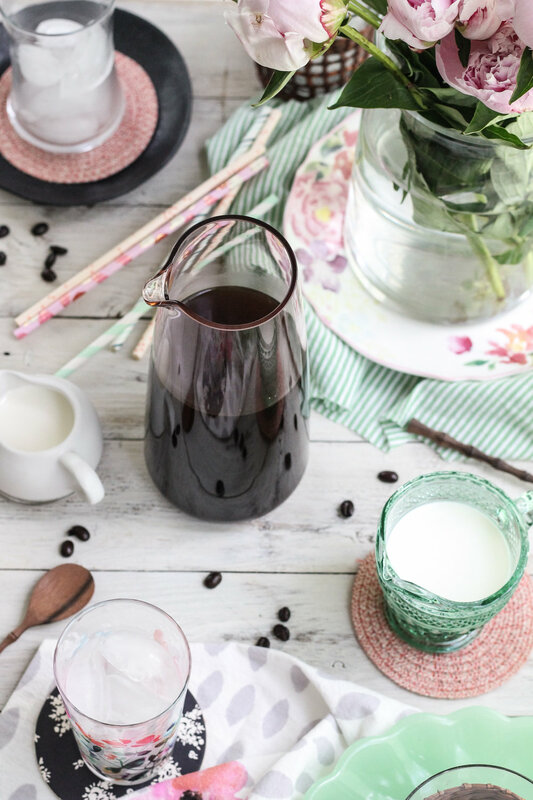 However, if I plan on sharing, I will often leave the coffee black and make myself a batch of simple syrup so that guests can sweeten to their own tastes. It's entirely up to you. My refrigerator is never without a bottle of simple syrup. I make big batches and stow it away in these handy plastic bottles for easy drink-making. Chilled coffee meets with plenty of ice, a heavy splash of cream, and hopefully an adorable paper straw. Cook's Note: The ratios given above are based upon the roast specified. You can certainly use any coffee you like, but you may need to adjust the amounts based upon your roast. Combine ground coffee and kosher salt in the bottom of a french press. Cover with boiling water, and set the top in place, but do not press. Brew for five minutes, then press very slowly. Pour the brewed coffee into a large pitcher and stir in granulated sugar. Cook's Note: I like my coffee on the sweet side, but feel free to adjust the sugar to your personal taste. You can also leave the sugar out entirely and make up a batch of simple syrup (recipe follows) so that you can sweeten each cup to taste. Once the sugar has dissolved, place the pitcher in the refrigerator and allow to chill completely; about 6 hours, or overnight. Pour the coffee over a glass of ice and stream in a splash of half and half. (I usually add about 2 tablespoons of half & half per cup of coffee.) . Serve immediately. Combine water and sugar in a small saucepan and place over medium high heat. While stirring constantly, bring to a simmer. Allow the syrup to simmer for one minute, then remove from heat and allow to cool completely before refrigerating.